I recall my mother “telling Mr Lees off” after the concert for having coins jingling in his pocket while he was conducting! Source unknown, but probably the West Bromwich News.) Well over 100 music lovers took the opportunity of hearing Handel’s church music played and sung in a church last Wednesday. The occasion was the third concert given by the Wednesbury Boys’ High School choir at St Bartholomew’s Church. The first item sung by the boys – who were accompanied by an orchestra made up of West Bromwich teachers, pupils, and members of West Bromwich Youth Orchestra – was Zadok the Priest. This stirring piece of music was later repeated, to the obvious enjoyment of all present. The choir then went on to sing Rejoice in the Lord alway by Purcell, and another coronation anthem by Handel, The King shall rejoice. In the middle of the concert, Handel’s Organ Concerto in F major was played by 19 years-old Andrew Goodwin, a pupil of Wolverhampton Grammar School. 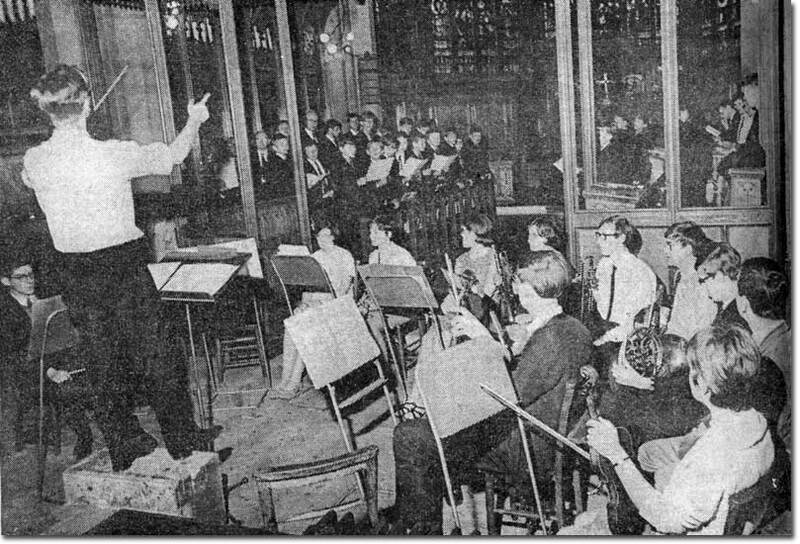 The Rev G Owen, Vicar of Wednesbury, said he was very pleased that the boys – who have previously performed Messiah and Mozart’s Requiem in the church – had come along to give another concert. “I welcome the opportunity of the visit by the school, and I hope the close contact between church and school will be kept up,” he added. Words written by art master, Alan Legge, with music by headmaster, Edgar Witcombe and music master, B S Smyth, the school song was first used in the late fifties. It waslast used at Speech Day 1969, after a petition (organised by yours truly) re-instated it to its rightful place for a final performance, despite the new management of Wood Green High School wanting to drop it from the proceedings! Although I have audio recordings of both the Hymn and Song, my free WordPress account does not allow me to provide music files for download. If anyone would like to have an MP3 copy of these, please contact me and I will send them by email. By greed, or sloth, or pride. To seek not vain reward. To wisdom – all discerning. With rulers good and craven. We strive – that’s all that matters. To Wednesbury’s seat of learning. With thanks to Les Gutteridge for creating the more legible, Capella versions of the music. Those with a musical talent, wishing to wallow in further nostalgia, may wish to re-live the music. Careful examination of the (hand-written) music will reveal, in the first introductory bar, the acciacatura C# which was first performed by music master, Timothy Lees, by accident (? ), and became traditional thereafter! The school hymn was also written by the Legge/Smyth partnership, and was used at the first and last assemblies of each term, as well as at Speech Day and the Commemoration Service. By the way, here’s a copy of that petition (87KB) , I mentioned earlier.